I didn't have any issues with mine either, until I went to the track. I used to have the Frozenboost Type 3 (4.5"x4.5"x10 core) in my CSX, with the type 101 (7" high x 3.5" thick) heat exchanger and about 3-4 gallons of capacity. At around 30psi on a GT3040 I was getting 120-125degF temp drop but around 3psi of pressure drop, and 125degF intake temps (measured using type K thermocouples on a cool day with 85degF water temps). I replaced the Frozenboost I/C with a custom A/W IC with a Bell core (6" x 5.3" x 12"), and on a 90 degree day in Memphis with about 25psi of boost and saw over 200 degF temperature drops and 140degF intake temps even with 126degF water temps. Unfortunately my pressure sensors have not been working so I haven't been able to log pressure drops yet. Just some data points, but the larger Bell core cools SIGNIFICANTLY better than the Frozenboost cooler did. I had the F.B. type 3 IC too and the type 117 (12"X12"X2") heat exchanger. I figured my IC was too small but to fit a lager IC it would have taken way to much re-engineering to make it work and even then it would have been a guess. With an air to air it took probably the same amount of re-engineering (spent 50-60 hours one week on it) but also freed up a lot of space in my engine compartment. Plus the air to air is proven so I went that route. Dyno'd my van today, 386 hp and 480 ft/lbs of torque. Ambient air temp was 93*. Max MAT was 168*. Last time I dyno’d it with the AWIC I netted 360/460 and ambient air temp was high 70's. At the track with my old AWIC my MAT was 200* and ambient was mid 70's. I want a 40hp increase with the air to air IC and my new intake plenum. Half way there. Last edited by A.J. ; 06-14-2018 at 06:16 PM. Good stuff! That van is really going to haul the groceries! Nice to see the old reliable A to A pay off. Hope the intake manifold works out better than the last few struggles. I got my new intake plenum done. I bought pieces from Ross Machine Racing. I probably have $500 in it. I increased the size of my throttle body. I had a 2.25" off of a H.O. 3.8L early to mid 2000's Dodge Caravan and upgraded to a 2.75" off of a '97 Ford 5.4L Expedition. Inside it actually necks down to 2.6" and the throttle blade is 2.75". My IC plumbing is 2.5". The throttle response now is f-ing amazing! I use to have to stab the throttle about 3/4 of the way to make it take off at a resonable amount of speed. Now there's no more lag. The boost use to stall at 5 psi and gradually increase. Now it rises with the RPMs. Love it when a combo comes together! lol, I just bought this off Ebay. Looks like the same TB except mine is 3"
How'd you deal with getting the factory throttle bracket on and what's your TPS setup look like? mine's going on an 8v though. I took apart a throttle body I had and welded on what I needed to make the cables work. I also had to plumb my IAC externally. I got the idea from an idle block that diyautotune.com sells but found one off of s ‘93 Jeep Gr Cherokee 4.0 and made it work. I’m using the Ford tps and pigtail. Since I’m using Megasquirt it doesn’t care what sensor I use. Last edited by A.J. ; 08-06-2018 at 01:54 AM. I’m doing it from my phone. I’m out of town. I’ll have to fix it Monday. 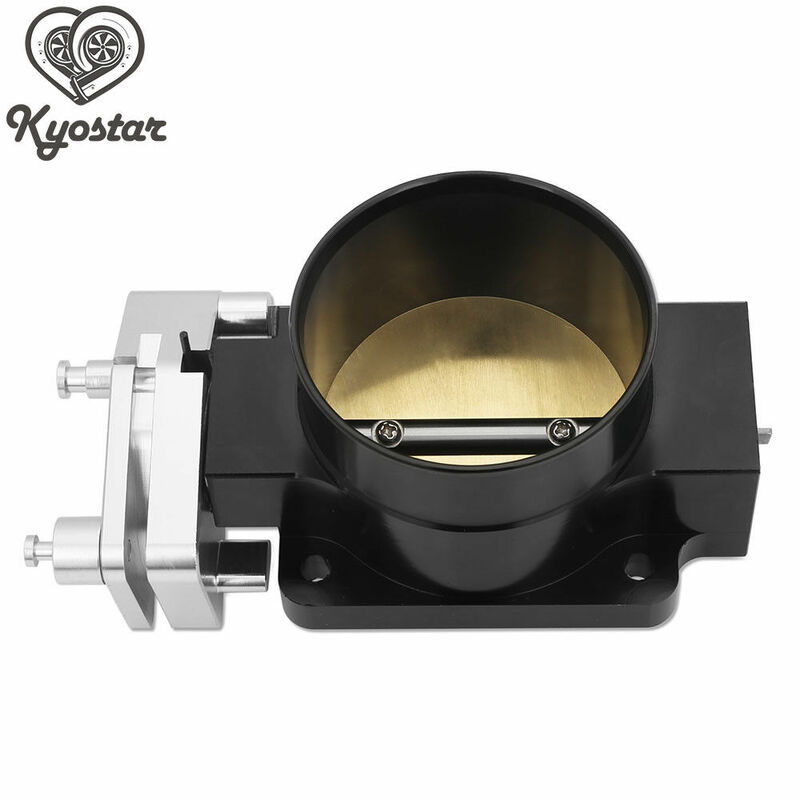 glad to hear your great experience with a larger throttle body. my 8v drives GREAT with the 58mm on it.. no loss of modulation or any other bad characteristics. im sure the 16 enjoys it even more. I put a larger throttle body on my ‘94 5.9 Dakota and the throttle is real jumpy off idle. I was concerned about that on my van running a larger tb and considered a progressive tb. But then I thought about how I have to 3/4 the throttle to get moving and sure enough, 1/4 throttle and it accelerates nice and smooth but isn’t herky-jerky. It’s a perfect size. I used an external AIS from a 3.3 or 3.5 Intrepid. I don't like how megasquirt seems to disagree with Mopar AIS motors. Not sure if its overheating or what. I used constant setting since it didnt want to respont. On constant it would sometimes stick open too Had to try 6 AIS motors till I found one that would follow instructions...all supposedly the same. I re-did my attachments. See if they work for you and let me know. I didn't have a problem with either of my AIS motors. First one was from the early 2000s HO 3.8 Gr Caravan and the second one was from a 93 Jeep Gr Cherokee 4.0. Here's some construction photos of my intake being built. This is looking down the velocity stack into the PT Cruiser aluminum lower intake. 2 outta the 6 attachments work in your last post. crazy thing is that they all worked yesterday when i clicked on them. this is the image hosting issue that has been plaguing this site for a few years now with no one seeming to try to fix it. This one is easy, I have myself to blame, I rush things, don't pay attention to gauges when I should, change to much stuff at once then expect miracles, the list is endless. By Frank in forum 2.0L/2.4L 16V Engine Swaps! Is there a valve cover difference between SRT 4 and 2.4 head?